I painted Apollo 11 Astronauts Neil Armstrong and Buzz Aldrin completing, in my opinion, the most significant thing they did during their historic journey. The flagstaff was stowed in two sections. The upper section included the flag mounted on a fold-up, telescoping metal rod. Neil remembered, "It went as planned except the telescoping top rod could not be extended. Both Buzz and I operating together were unable to apply enough force to extend it." Buzz added, "We thought maybe we could extend the rod by both pulling, but we didn't dare exert too much force because, if it ever gave way, we'd find ourselves off balance." It was only a few minutes later that President Richard Nixon, calling by telephone from the Oval Office in the White House, said, "For one priceless moment in the whole history of man, all the people on this Earth are truly one; one in their pride in what you have done, and one in our prayers that you will return safely to Earth." The television picture we all watched was from their black-and-white camera, some 40 feet in distance. 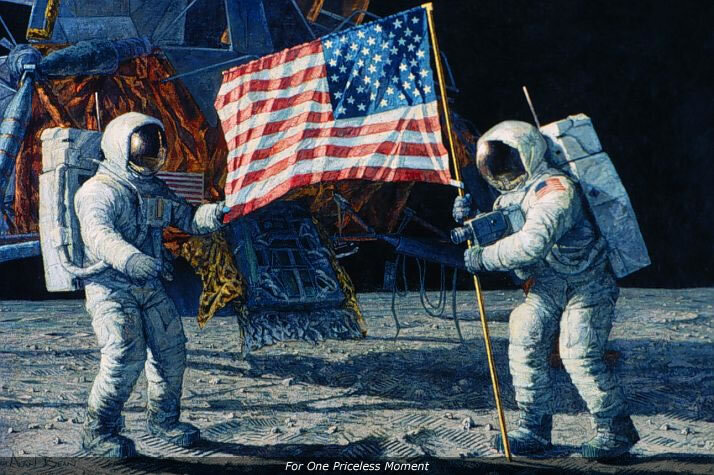 I composed this painting so that, if you stand back exactly eight feet, you will see Neil and Buzz and our flag, with the Eagle in the background, just as if you stood nineteen feet away on the Sea of Tranquility, Sunday, July 20, 1969.